You are currently browsing the daily archive for May 26, 2010. 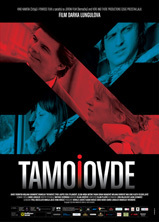 It’s won a ton of awards, including Tribeca’s New York Award which seems odd since it paints the city in a not so great light, (besides it’s beacon of freedom for an immigrant Serbian couple), and after watching Tamo i ovde [Here and There] for myself, I can see why. It is a sweet story about one man’s washed up and defeated life, finding purpose where he’d least expect it. Down-on-his-luck, bitter, depressed, and all around cantankerous in his antisocial indifference, David Thornton’s Robert looks like he is one hour away from jumping off the Brooklyn Bridge, ending his misery once and for all. Evicted, unable to play the saxophone that’s been his meal ticket all his adulthood, and tossed to the curb by his one and only friend, (a quick cameo from his real life wife Cyndi Lauper), not even running into an old acquaintance can shake him from his daze. It’s the city that never sleeps and has obviously finished its need for Robert, relegating him to the streets in search of money and a place to stay. Who knew a Serbian furniture mover working alone out of his van could supply both? The proposition is as follows: Robert goes to Serbia, acquires five thousand dollars for his troubles, and marries Branko’s (Branislav Trifunovic) girlfriend, allowing her to enter the American embassy for a spousal visa to come to NYC for a reunion with her love. Robert has nothing better to do and one short hour helping his new friend move couches proves the manual labor route isn’t in the cards, so a handshake later sees him getting off a plane in Belgrade—a city in turmoil and obviously behind the times in many ways, but also appearing to have some of the kindest citizens around, each in awe of and in need to befriend the new American in town. Cranky and impolite, he stays with Branko’s mother Olga (Mirjana Karanovic), scolding her for taking his clothes rather than thanking her for cleaning them, and goes about town with Ivana (Jelena Mrdja) as she readies for the marriage that will set her free. While this is all happening, however, Branko is still in New York looking to work as many jobs as possible to pay the fee before the wedding date. His van gets stolen and he unfortunately puts trust into a Spanish mechanic looking to make some quick cash. Misery sure likes company and the Robert/Branko duo has it in spades. Here and There soon becomes writer/director Darko Lungulov’s Hallmark card to both NYC and Serbia, allowing two young lovers the dream of American living and one man stuck in a perpetual mid-life crisis the opportunity to get away and start fresh. Both stories become interweaved as we see Robert opening up and discovering the beauty and compassion in Olga as well as the exuberant neighborhood locals while Branko begins to fall into a dark hole, desperate to do whatever it takes to ensure Ivana safe passage to him. The mover starts to look for a new van so business can get back on track, his fiancé hoping to appeal to Robert’s humanity to fulfill his side of the agreement—a trait I don’t think anyone could see inhabiting his dejected visage of self-pity. Somehow, though, Olga breaks through with her unabashed kindness, generously giving to this stranger based on the simple fact he is a friend of her son’s, a boy she hopes is finding the joy he seeks. New York is filled to the brim with selfish parasites, including Robert after we watch him blowing off an old friend genuinely happy to see him; despite the suffering around them, Belgrade is conversely occupied by an optimistic and charitable public. These Serbians are the highlight of the film, though. Trifunovic’s escapades in New York are fun and heartbreaking at the same time, but used somewhat as an after-thought to mirror Robert’s own trials in the Balkans. Branko meets a man he assumes to be kind and trustworthy, only to find that stereotypical American looking to play any angle he can. Juxtaposing that with the flirtatious corner store employee hitting on Robert to take her away with him back to New York and the jolly Tosha Rajkovic shows how much both sides take for granted. Tosha is played by Fedja Stojanovic with an over-abundant fervor for life, befriending this stranger, one who initially wanted to get away before soon finding someone willing to take him in without question. Sure Tosha uses his proximity for introductions as ‘my American friend’, but there is more to the relationship than solely an ego trip. Robert is involved in the lives of his neighbors and therefore worthy of Tosha’s time and interest. His is the role epitomizing the film’s quest to show what a full life actually holds—love and optimism. But the film is ultimately a portrait of one man’s redemption against all odds, including his own self-destructive nature. In that regard, Thornton is pretty great as the lead character, always sour in his disposition, but constantly surprising us at the same time once he discovers good times may still be ahead. His muse for that revelation is Karanovic’s Olga, a teacher willing to do anything for her son. The performance singles itself out with its full spectrum of emotion from unsure kindness to a willing partner in love to the one person in position to give all parties what they need for happiness, at the sacrifice of her own of course. Thornton may make his mark with the gradual evolution of character, but Karanovic shines bright as the constant maternal voice, strong and confident, knowing when all was said and done, she’d still have her flowers on the terrace begging for her voice in song to make them vibrant. Olga not only waters those plants, but also each and every person her life touches.